Since I started cycling to work my eating habits have changed slightly. In the morning, before cycling, I have a small portion of muesli, enough to keep me going for almost 3 hours. 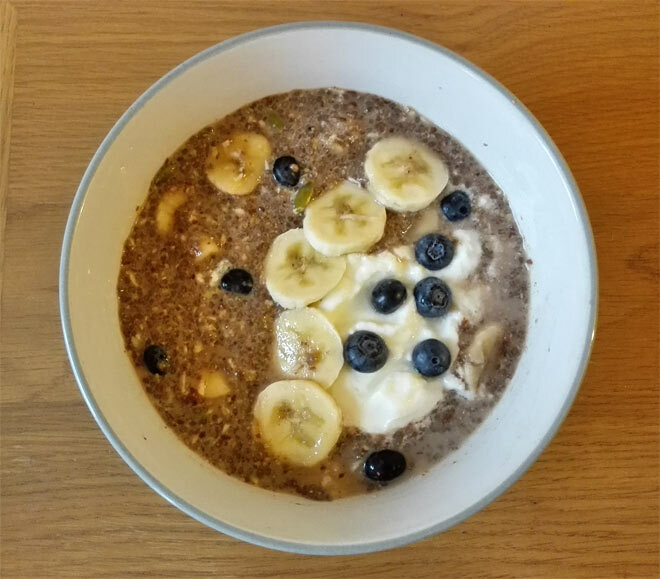 Later in the morning I have my second breakfast and that would normally be banana and blueberry chia pudding which I prepared the night before. I add fruits in the morning while the rest of the ingredients I soak in almond milk overnight. This makes the whole meal easier to digest and various nutrients are better absorbed by my body. 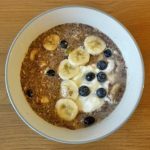 This chia pudding is very similar to low-carb breakfast I previously shared on my blog, only that it’s higher in carbs. Have you tried chia seeds before? I really like them, especially for breakfast. They have no particular flavour and once you leave them to soak, they absorb liquid like a sponge and turn into a gel-like substance. These tiny seeds are an ancient superfood originating from South America. They are eaten by Tarahumara people, a north-west Mexican tribe of super athletes who are the world’s greatest long distance runners. The Tarahumara people run 50 or 100 of miles at a time for pure enjoyment and eating chia seeds before the run is believed to give them stamina for their long running journeys. Chia seeds are packed with nutrients such as omega 3 fatty acids, calcium, magnesium and manganese (good for your knees!). They are also rich in antioxidants, high in fibre and high in quality protein. What’s more, they are naturally gluten-free making them suitable for those suffering from gluten intolerance. You can find several brands selling chia seeds online and lately I’ve been enjoying organic chia seeds from Healthy Bee. These are currently on offer on Amazon and it’s a pretty good deal actually. For 450g you will pay £4.99. If you intend to buy them hurry, because you never know when the offer will end! When buying chia seeds online you should look for organic, chemical-free chia seeds from reputable companies. 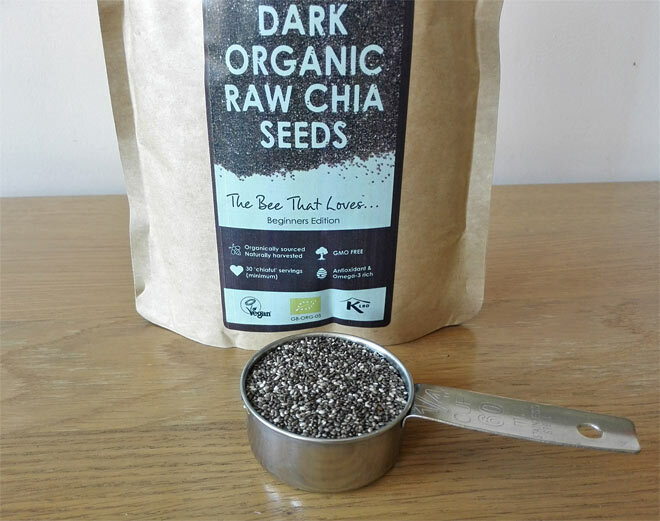 Buying in bulk is cheaper but if you don’t think you will use chia seeds every day, then buying a smaller pack, such as the one from Healthy Bee, may be more convenient for you. Buying from a reputable company means you will get good quality seeds, free from weed seeds and plant parts. Yes, it happens, you can buy some really bad stuff online, so be careful! Also worth knowing, chia seeds can be either black or white. If they are brown it means they are immature seeds and have lower oil, protein, omega3 etc. contents. It’s normal you will find a few brown seeds in any pack you buy but if the seeds are mostly brown, that means really poor quality! Place all the ingredients (apart from the fruits) in a jar or container and mix well. You can skip some of the ingredients if you don't have them. Cover the mixture and leave in the fridge overnight. In the morning check the consistency and if needed add some extra almond milk. Before serving add sliced banana, blueberries and if desired some Greek yogurt. Once you add all the ingredients together and soak overnight you actually get quite a big serving. I don't eat it all at once. I have some in the mid morning but also in the afternoon as a snack. If you don't eat two breakfasts like me you can just have it as your main breakfast and it will really fill you up. Do you use chia seeds and if yes, what’s your favourite way of eating them? Chia pudding is an awesome breakfast idea, especially with sweet blueberries, mmm. I hope you like it Rebecca! It’s one of my favourite breakfasts. I am glad to hear you liked it! I made this recipe this evening to the directions and it was so good!! Did you? I am so happy to hear that! It’s one of my favourite breakfasts.. This is what I call a healthy breakfast idea! Awesome recipe, Petra! Glad to hear you like it Agness! I love it because it’s so filling. 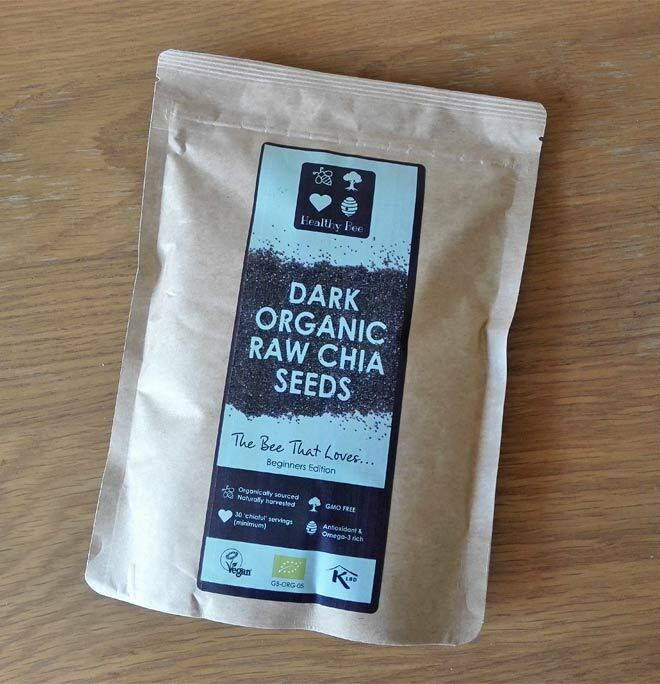 If you soak chia seeeds I don’t think they could get stuck in your teeth, at least it never happened to me before!